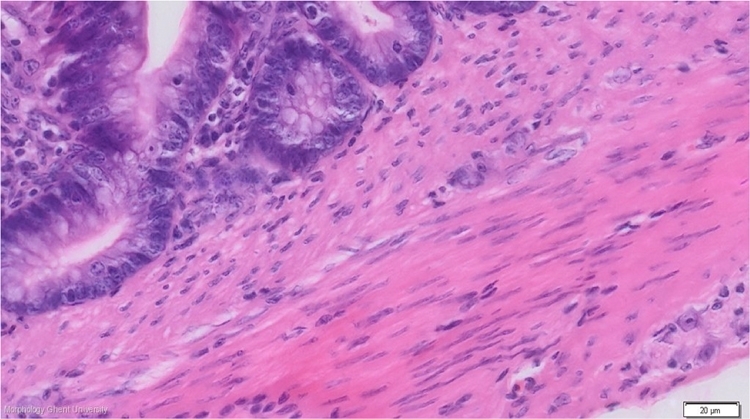 The lining epithelium of the villi and the crypts of the small intestine is a simple columnar epithelium with columnar enterocytes which possesses the microvilli apically, mucous goblet cells and enterochromaffin cells. From duodenum onto ileum, the number of goblet cells increases whereas the number of enterochromaffin cells decreases. On the micrograph above, the T. submucosa is only visible where the neurons of the nerve plexus (submucosal plexus of Meissner) increase its thickness.